Without getting too serious, I've been having an internal debate about whether or not I should post this recipe. When I post sweets or treats, I like them to have some sort of whole grain twist, or feature a natural sweetener. I mean, that's usually how I cook and bake. 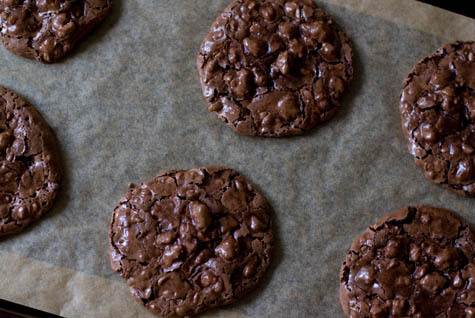 But I have a big-time crush on this cookie, and I figured I'd post the recipe in all it's powdered sugar, chocolaty glory in case some of you want to make a batch. In short, there are just six ingredients between you a baking sheet of these, no mixer necessary - just a big bowl and wooden spoon. As far as the origins of this recipe? I came across a recipe shortly after my return from Portland that sounded very close to the cookie I tasted there (they seemed to be a version of the François Payard's Flourless Chocolate-Walnut Cookie), but the recipe I was working from didn't work all that well for me. The good news is, it did provide a good starting point. I adjusted a few ingredients and my technique, and now I've been able to make them reliably. That being said, please read the head notes before making these, they have a few quirks that aren't like other cookies - and I've outlined the exact ingredients I've tested and had success with. I've used both 365 organic powdered sugar from Whole Foods, and Hain organic powdered sugar with success. I prefer to use non-alkalized cocoa powder (Scharffen Berger or Dagoba) but also tested with Droste, which is a Dutch-process cocoa powder. All with success. On the nut front, be mindful of how you toast your walnuts - it's the single factor that impacts the personality of these cookies most. Using deeply toasted walnuts makes for a much more intense, nutty cookie. Lightly toasted walnuts can sometimes be mistaken for chocolate chips, and make for a much more mild cookie. Both good! Also, cooking time - you don't want to over or under bake here - over bake, and your cookies will cool too a crisp, under bake, and they are too floppy and crumbly. Also, underbaking makes it more difficult to remove the cookies from the parchment paper after baking - you get the swing of it after a batch or two. Use large eggs, I suspect if you use extra-large, the batter will run, and you'll have to compensate with more powdered sugar. Spoon the batter onto the prepared sheets in mounds of about 2 tablespoons each, allowing for PLENTY of room between cookies. These cookies are like reverse Shrinky Dinks - they really expand. Don't try to get more than 6 cookies on each sheet, and try to avoid placing the batter too close to the edge of the pan.